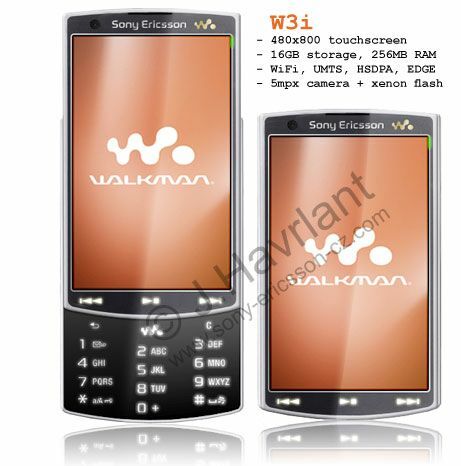 Sony Ericsson W3i, Touchscreen Plus Neat Camera, Why Walkman? The Sony Ericsson W3i was designed by J. Havrlant, one of the most prolific SE concept creators, who this time shows us that Walkman phones can have good cameras and hot specs. This Walkman concept comes with a 480 x 800 touchscreen, 16 GB storage space, 256 MB RAM and a 5 megapixel camera with a Xenon flash. The Sony Ericsson W3i also handles connectivity quite well, offering WiFi, UMTS, HSDPA and EDGE support. Other than that, we’re dealing with a fancy slider that can rival any iPod/music phone.